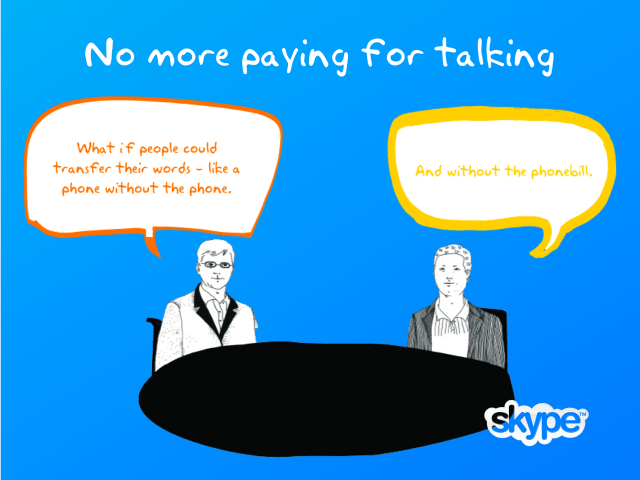 on Oct 09, 2013 at 2:00 PM EDT. 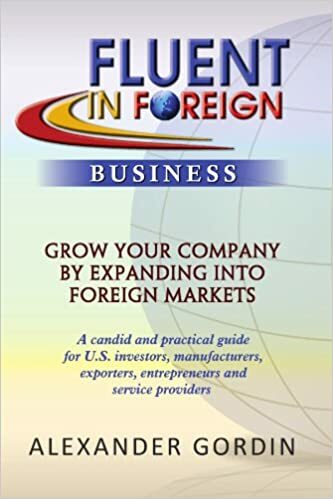 Professionals at Fluent In Foreign Business have developed a program that effectively and efficiently connects emerging countries with companies and investors that are ready, willing and able to provide needed products and services. 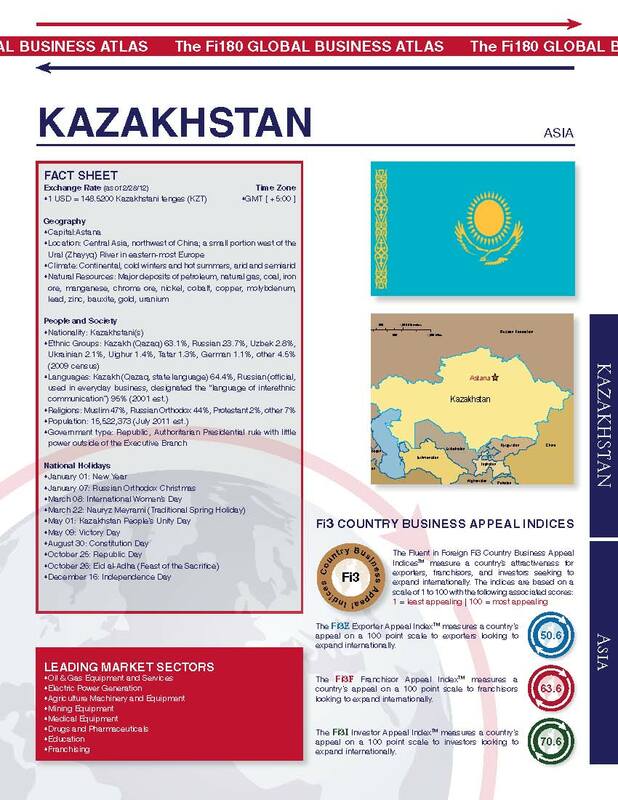 This initiative addresses several fundamental problems currently hindering international business such as cross-culture gaps, lack of financing, risk mitigation and legal compliance with anti-corruption and anti-money laundering legislature. Fluent In Foreign also provides a cost-effective platform for pre-selected Emerging market companies, as well as North American exporters, investors, project developers and franchisors to access and take advantage of qualified business opportunities in more than 40 of the most promising emerging markets. 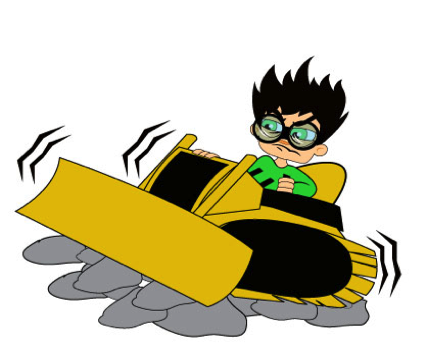 we found Countrylicious, an outstanding project by Romanian software engineer Daniel Chirita. we took his information mad made one. Toto’s toilet plant in Morrow, Ga., uses a combination of manual craftsmanship and robotic labor to help reduce costs and cut production time. PERRYSVILLE, Ohio—In previous management jobs, Jim Morando watched Chinese imports engulf the U.S. market for vinyl tiles, wood flooring and window blinds. After decades of losing out to foreign rivals, U.S. manufacturing of toilets is making a surprising, if modest, comeback—mostly under foreign ownership. Mansfield Plumbing, owned since 2004 by Organizacion Corona of Colombia, is spending $9 million to expand the capacity of its Perrysville plant by nearly 50%. Another toilet maker, Toto Ltd. 5332.TO -1.61% of Japan, is installing new casting machinery to raise capacity at its Morrow, Ga., plant about 5%. David Walter Banks for The Wall Street Journal Nearly finished toilets move through a Toto factory in Morrow, Ga.
American Standard Brands, bought earlier this year by Lixil Corp.5938.TO -1.13% of Japan, is installing a new kiln and refurbishing other parts of its Nevada, Mo., plant, boosting capacity 5% to 10%. 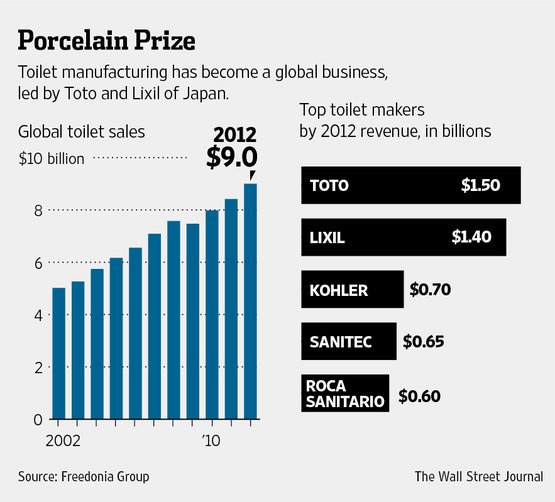 The toilet turnaround is a microcosm of U.S. manufacturing trends. “The days of chasing cheap labor around the world are coming to an end,” said William Strang, who heads the operations division for Toto in the Americas. Toto is reducing trans-Pacific shipments and relying more on U.S. and Mexican plants for its sales in North America. Making toilets requires lots of manual labor—”very much like making pottery,” as one industry executive puts it. 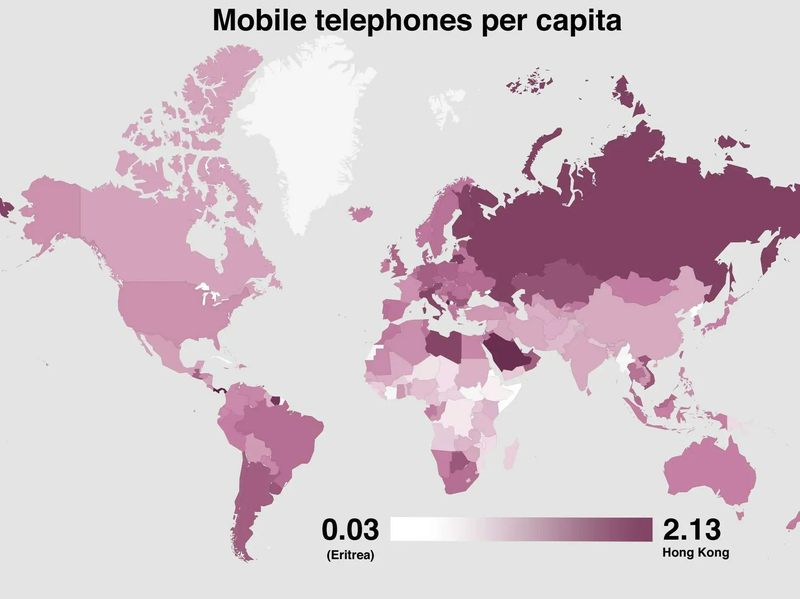 That is why most production moved over the past two decades to lower-cost countries, mostly China and Mexico. The work is demanding, requiring muscles to lift bowls and tanks, as well as a delicate touch to smooth surfaces. “You need the strength of a football player and the hands of a sculptor,” Manfield’s Mr. Morando said as workers in muscle shirts hoisted newly baked porcelain on a recent afternoon. Three-quarters of the 10.6 million residential and commercial toilets sold in the U.S. last year were imports, estimates Victor Post, vice president of GMP Research Inc., a research firm based in Mount Pleasant, S.C. There are just seven toilet plants in the U.S. today, down from 48 in the late 1970s, Mr. Morando said. Much of that capacity may never return, but industry executives now see U.S. production as a viable alternative. Even if they don’t build new plants in the U.S., they are more inclined to add capacity in nearby Mexico rather than in China so they can reduce shipping times. In addition, ocean-shipping costs and Chinese wages have risen, making production there less attractive. 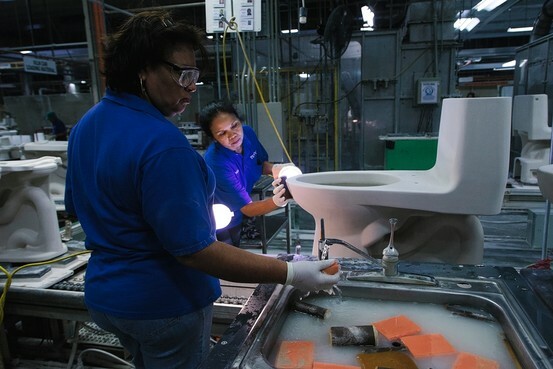 Kohler has kept three U.S. toilet plants—in Kohler, Wis.; Brownsville, Texas, and Spartanburg, S.C.—and runs a large plant in Monterrey, Mexico. Many smaller U.S. suppliers moved all their production outside the U.S. When he arrived at Mansfield in early 2006, Mr. Morando said, the factory in Perrysville was “on the ropes,” with production costs about 20% above Chinese imports. But Mr. Morando wanted to keep production in the U.S. That would allow the company to differentiate itself by stressing its ability to get products to customers faster, respond quickly to changes in consumer preferences, and offer a “Made in U.S.A” label, which Mr. Morando believes is increasingly appealing. To cut costs, Mansfield automated administrative processes such as order-taking and reduced inventories, among other things. Workers, represented by the International Brotherhood of Teamsters, accepted a wage freeze that lasted until 2012 and shouldered a larger share of health-care costs. “We’ve worked together to get them through a rough time,” said Mike Markham, secretary-treasurer of the Teamsters local that represents workers. Mansfield employs about 480 people in Perrysville, up from 370 four years ago, and expects to raise that head count to about 550 within six months, Mr. Morando said. In Georgia, Toto has increased automation. New Motoman robots, from Japan’sYaskawa Electric Corp., 6506.TO -2.18% spray glaze on the toilets, a job done by people in many factories. Those new robots are about twice as fast as the previous ones used by Toto. Still, much of the work needs to be done by hand, partly because the clay used to make toilets is fragile during the production process and could easily be damaged by machinery. People don’t need to be reprogrammed every time a style changes slightly. Clay arrives at the plant as powder. Giant blades stir the powder with water into a gray soup, pumped via pipes and hoses into molds. After the clay bowls emerge from the molds, workers use sponges to smooth the surfaces. “The human hand is much more sensitive and capable” than a robot for such tasks, Toto’s Mr. Strang said. The workers bond the rim of the toilet to the bowl by hand. A custom-made machine gingerly grasps the clay bowl and turns it upside down so workers can inspect the underside. Then a conveyor belt moves the toilets into a drying room, where they sweat out excess liquid. After drying, the robots spray on glaze, a liquid that provides the hard, shiny surface. Then the toilets spend roughly 18 hours baking in a kiln at a temperature of 1,800 degrees Fahrenheit. Next come final assembly and testing. Annie Shannon whacks each newly baked toilet with a wooden mallet. “It should sound like a bell,” said Ms. Shannon, who has worked in the plant for 15 years. If the sound is flat, there might be a hairline crack in the porcelain. Offshore Accounts: No Place to Hide? The U.S.’s intense crackdown on tax evasion is entering a new phase. For decades U.S. tax authorities did little to enforce laws on offshore accounts. Some people felt free to hide assets abroad in a web of secret accounts, and many U.S. citizens living abroad didn’t bother to file returns with Uncle Sam as long as they paid local taxes. 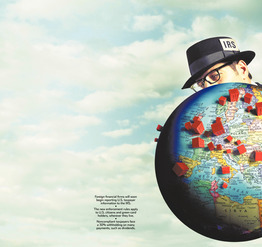 All that changed in 2009, when U.S. officials began an intense campaign against undeclared accounts after UBS AG UBSN.VX -0.82% admitted that it helped U.S. taxpayers hide money abroad. The Swiss bank paid $780 million and turned over more than 4,000 names to avoid criminal charges. Randy Webb sees scant evidence of a U.S. manufacturing rebound in the Ohio plant where he’s fixed aircraft electronics for 25 years. Honeywell International Inc. (HON) is closing the shop in 2014 as it expands such work overseas. Webb is among 80 employees poised to lose their jobs in Strongsville, Ohio, outside Cleveland, near where General Electric Co. (GE) will shut a lighting factory in favor of production in Hungary. Delphi Automotive Plc (DLPH) is sending parts assembly to Mexico from Flint, Michigan, and Eaton Corp. (ETN) will make extra-large hydraulic cylinders in the Netherlands, not Alabama. The U.S. industrial comeback, an idea embraced by President Barack Obama and some economists as 12 years of factory-job losses gave way to three annual gains, is now sputtering. Even with nonfarm payrolls up 1.1 percent in 2013 to 136.1 million, manufacturing has stagnated at less than 12 million. Factories added more than 500,000 positions after falling in February 2010 to the lowest since 1941. That left the factory workforce through August about 13 percent smaller than the 13.7 million when the U.S. fell into recession in December 2007. In 2000, the tally was 17 million. “I know all of us are concerned about manufacturing, but it’s not going to come home to the degree that it used to be,” Federal Reserve Bank of Dallas President Richard Fisher said at a Sept. 5 event in Dallas. For GE, higher U.S. expenses mean sending assembly of high-intensity discharge lamps to Budapest from a factory with 160 workers in Ravenna, Ohio. “This particular product that was at Ravenna was made more cost competitively in Hungary,” said Christopher Augustine, a spokesman for Fairfield, Connecticut-based GE. Hungary is GE’s global production center for that product line, just as fluorescent-lamp output is centered elsewhere in Ohio, in Bucyrus, Augustine said. Many of those lights go to U.S. customers, he said. Honeywell has cut its U.S. workforce by 5,000 positions to 52,000 since 2007 while adding 15,000 employees abroad, for a total of 80,000 outside the country. Strongsville is one of two avionics repair shops closing in the U.S., along with one in Irving, Texas, said Steve Brecken, a Honeywell spokesman. U.S. operations are being consolidated in Renton, Washington, and Wichita, Kansas, and part of the work is being transferred to a U.S.-based contractor, he said. Morris Township, New Jersey-based Honeywell is expanding outside the U.S. at shops in Singapore and Shanghai to meet rising demand there, Brecken said. Obama’s efforts to nurture a manufacturing comeback include the National Export Initiative he announced in March 2010, a month after factory payrolls slid to 11.5 million. The goal was to double U.S. exports and create 2 million jobs, with programs such as financing for small- and medium-sized businesses to boost sales overseas. In February, he laid out a four-point plan to revitalize manufacturing in his State of the Unionaddress, including cutting the tax rate on manufacturers to 25 percent from a top federal corporate rate of 35 percent. Seven months later, tax changes remain stalled in a gridlocked Congress. The National Association of Manufacturers, often at odds with Obama over policy issues, agrees with him on the prospect of a factory rebirth. With cheap natural gas from U.S. shale deposits and increased automation reducing labor’s share of manufacturing costs, U.S. factories can compete with those in low-wage countries, said Chad Moutray, the Washington-based group’s chief economist. One discouraging sign that manufacturing employment is recovering: the 13 percent gap between factory payrolls now and before the recession occurred amid a rebound in output, said Tim Quinlan, a Wells Fargo & Co. economist in Charlotte, North Carolina. Industrial productiontrails a 2007 pre-recession high by only 1.9 percentage points. With manufacturing employment up only 0.1 percent through August, job growth is just about keeping pace with losses such as the pending shutdown in November of Delphi’s Flint factory, with 300 employees. The work is being moved to Mexico, according to a Trade Adjustment Assistance petition filed with the U.S. Labor Department. Tom Wickham, a spokesman for General Motors Co. (GM), which supplied unionized hourly workers for the plant supervised by Troy, Michigan-based Delphi, confirmed the closing. Eaton said in a petition that it shuttered its hydraulic-cylinder plant in Decatur, Alabama, in July. Scott Schroeder, a spokesman for Dublin, Ireland-based Eaton, said consolidating production boosts efficiency. In Tempe, Arizona, contract electronics manufacturer Jabil Circuit Inc. (JBL)will eliminate about 500 positions with a factory closing. “We are in the process of moving several assemblies to other Jabil facilities in Mexico and Asia in order to reduce labor costs and meet our customers’ pricing expectations,” the St. Petersburg, Florida-based company said in a Trade Adjustment Assistance petition. Beth Walters, a Jabil spokeswoman, said by e-mail that the plant will close within a year. Webb, who said he helped train Honeywell employees from abroad who now perform work once done in the U.S., can relate to displaced workers at other U.S. manufacturers. If he can’t find a job near Strongsville with equal pay, he may pursue a long-held desire to become a high school teacher. In the meantime, he goes to work each day amid the strain of a months-long wind-down before what may be the end of his career in avionics repair. Fresh from the Group of 20summit meeting in St. Petersburg, Russia, Mr. Xi referred to Kazakhstan as an increasingly important energy supplier for China and an anchor for its new “marching westwards” policy, which looks to quickly strengthen economic and strategic relations with Central Asia.